Imagine being in France in the mid-1980s and thinking that a 20-year-0ld Citroen 2CV isn’t esoteric enough on the streets for your taste. You like the idea of the aircooled front-driver, but you’re looking for something a little more sporting and rare. Maybe something that offers open air motoring; something as dangerous as your daily packs of unfiltered cigarettes. There were quite a few of the deux chevaux around in those days, so you probably aren’t the only one. Thankfully those wild British chaps to the north were happy to capitalize on the ubiquity of the 2CV by crafting the Lomax 223 Cyclecar. That name, 223, is sourced from the car’s two-cylinder, two-seat, three-wheel layout. It’s perfect for your needs. Any car with three different VIN tags is bound to be popular with esoteric car fanatics like myself. The first came in 1967 when the car was first built in a Citroen factory. The second VIN tag was added when the car was updated to Lomax three-wheeler bodywork a couple decades later. The third VIN tag was added in 1993 when the car was imported to Michigan and the Secretary of State decided that the only legal way to register it in the state was to call it an “assembled motorcycle” kit-style car. Even more perfect. From a drivetrain perspective, this car remains effectively unchanged from its 2CV roots, and even keeps the original one-spoke steering wheel and column. Unlike many three-wheelers, especially those home-built bike-based jobs, the Lomax has a gearbox with a reverse, as it keeps the original Citroen 4-speed. 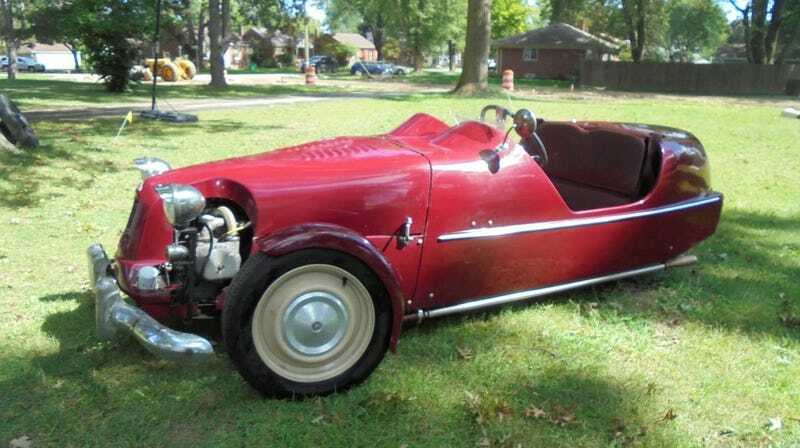 The earliest Lomax models actually had two rear wheels mounted very close together, but this one is a slightly later proper single rear wheel three-wheeler. This motorized contraption is not incredibly fast, as its Citroen underpinnings might indicate, making use of only about 30 horsepower. It is aided in the sportif department by its light weight, throwing around just about 950 pounds of fiberglass body on Citroen floor pan. Perhaps a little unbelievably, the Lomax 223 Cyclecar has never gone out of production. Similarly to the Lotus Seven, the rights to production of the body have simply traded hands a few times, and you can still order a new Lomax from Cradley Motor Works. The 223 does not have a top, and barely has a windshield, but it offers better stability and comfort than most motorcycles. Even better, the current manufacturer claims the car will achieve nearly 60 miles per gallon in the city, making it the perfect car for around-town nice-weather use. This particular example is available for bidding on eBay at the moment. The seller says he enjoyed driving the little runabout, but “with winter coming I have too many projects and no where to store this beautiful machine and would rather have it sitting in someone else’s collection in heated storage.” It’s cheap and weird enough to win a lot of internet cool guy points, so maybe you should go bid on this before it ends up in my heated storage.